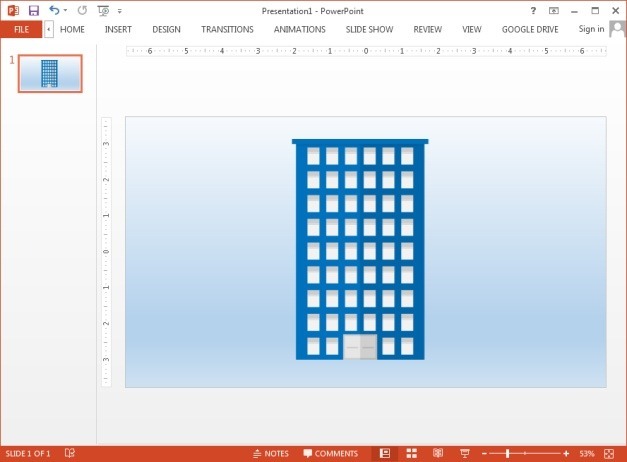 Want to depict high rise buildings in your presentations? How about infographics made up of skyscrapers? 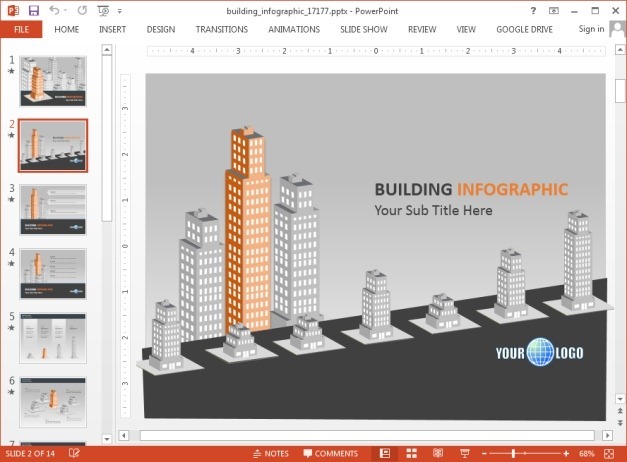 The template we are going to review in this post is a building themed infographic template with built-in animations. 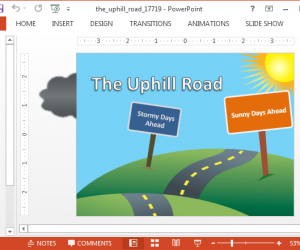 The sample building themed slides can be easily moulded for making infographics and common presentation slides. 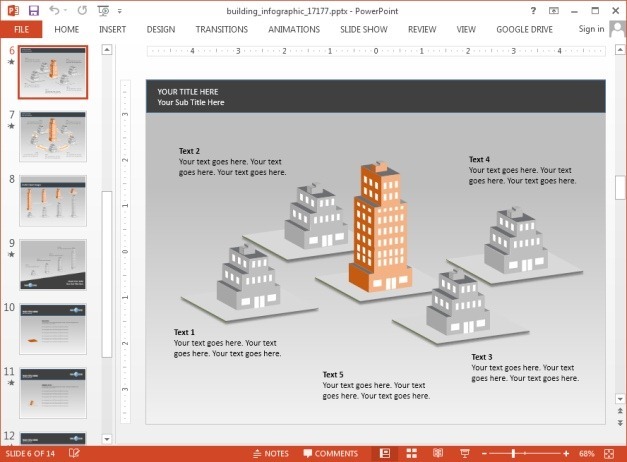 There are various placeholders in this animated buildings PowerPoint template for adding text and you can also add images and data charts by editing the over dozen slides. 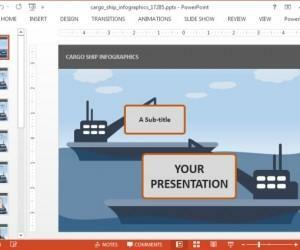 The slide colors are generally a mix of orange, grey and white, however, you can easily change the building colors using shape fill in PowerPoint. 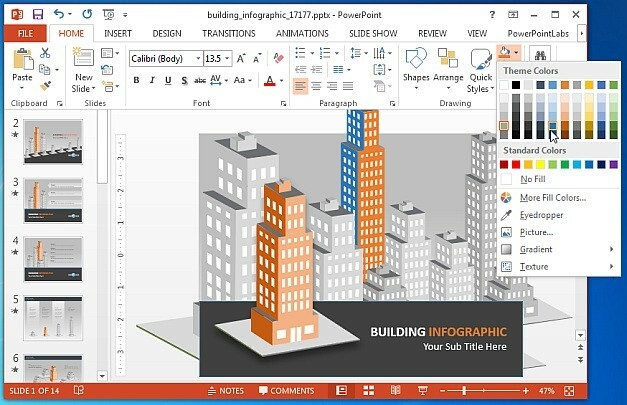 This can help you color different buildings with various colors to depict trends, ideas and to create diagrams from building illustrations within slides. 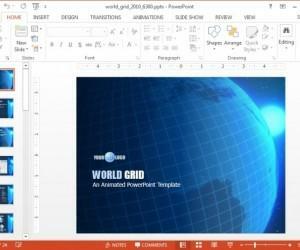 The building can be used to represent data sets, trends or to create presentation slides for any topic that fits the imagery, be it related to real estate, finance, sales, or even topics like economics, trade, capital markets, etc. 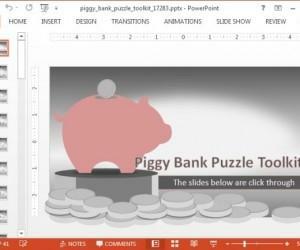 This template is basically like a stencil for making infographics and even regular presentation slides, with the scope for coloring the layouts like a coloring book. 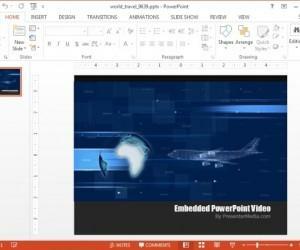 This leaves ample scope to mould the sample content according to the requirements of your topic; where you can add or remove elements from sample slides to depict your own illustrations. 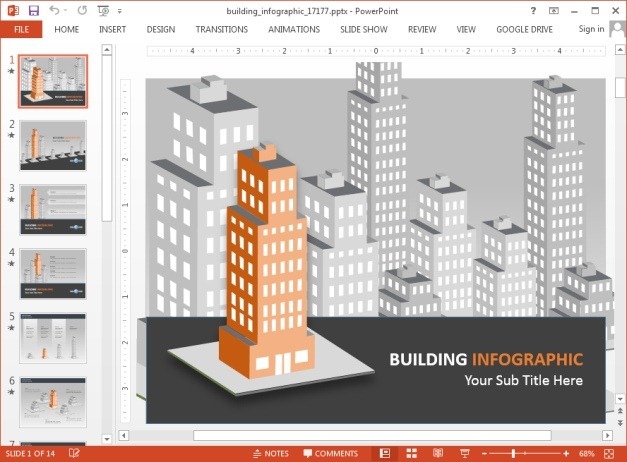 This animated building themed template is downloadable in PPTX, as well as KEY format. This is a simple apartment building clipart which is available in transparent and white backgrounds. 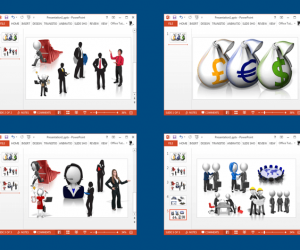 This is one of many clipart images that you can download from the Presenter Media website. For demonstrative purposes we placed the transparent version of this clipart over a blue gradient background in PowerPoint.